I am slightly hesitant to post this recipe on Cat Can Cook, but I’m gonna do it all the same. You know how I am all about the EASY recipes? Well, crepes have a certain knack to them, and they do take a little practice to master. But, I trust you and I know you will make a masterpiece crepe with just a little practice! The recipe itself has only a few ingredients, which are thrown into the blender to combine, and the filling is simply fresh fruit. So, play with them and practice making them, and soon you’ll be a crepe-making super star! What better time is there when all the fresh fruit is in season…experiment with fillings and find your perfect one. Okay, here is the more challenging part – cooking them. First, you’ll need a really good non-stick pan. Heat your pan up to medium-high. Now the fun part! Pour about a pancake size amount of batter into the centre of the pan, and then quickly swirl the pan around so that the batter spreads out and fills the bottom of the pan in a circular shape. Loosen the sides of the batter gently, as it cooks. Once bubbly in the middle (about 1 minute or so) flip the crepe over and brown a little on the other side.If it broke, stuck or went all wonky, do not despair! You have plenty of batter to make more. 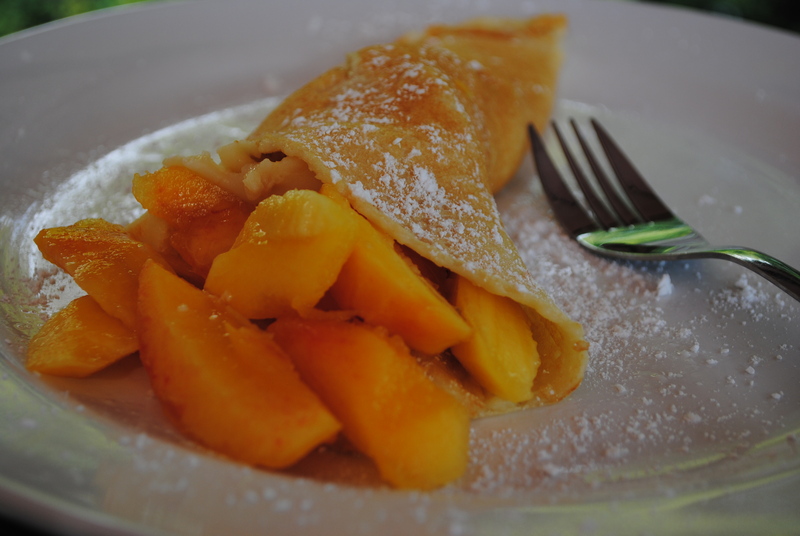 Put the crepe on a plate, top with fruit, roll up and dust with icing sugar. We like ours with Maple Syrup on them, but you can also add ice cream, or preserves…you can also make savoury crepes too but that’s another story! Yes crepes do take a bit to get used to making 🙂 I saw in grocery store – think it was Sobey’s, prepackaged crepes. I found this perplexing, but for those too timid to try making, you can also buy frozen apparently. + 1/2 cup (125ml) orange juice, either bring to boil and simmer 2 min on stove, or nuke 1 or 2 min. Savory crepes .. mmm – ex used to make, and found secret was doing crepes night before, and then building. Hmmm – frozen crepes eh? About as strange as frozen pancakes!